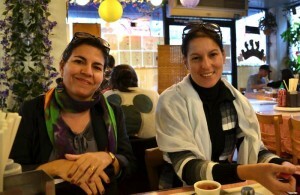 A Message from ICAP’s Kenia Serrano and Leima Martínez: Thanks to All Our Friends in the U.S.
We express our deep sense of gratitude for the unforgettable meetings that you organized for our delegation in which we could exchange with hundreds of people and dozens of solidarity groups in New York, New Jersey, Washington-DC and California from November 3 to 17. This visit allowed us to reconfirm that our peoples have had a continuous and nonstop relationship. In this complex moment towards the normalization of our diplomatic relations we will seize our fortitude and opportunities to face the challenges that persist. There are big obstacles interfering in our sincere desire to establish civilized relations between Cuba and the US and those are the blockade, the illegal occupation of the territory of Guantánamo and the regime-change programs. We also noticed how productive this type of visit is because it gives us the opportunity to know first-hand the concerns of our friends about the Cuban Revolution and the prospects and challenges we have, as well as the struggles of the different sectors of the American society that in essence are looking for social and racial justice. We all learned and got full of energy to face the present moments and to strengthen the hope to see the solidarity movement in the US more united, dynamic and coordinated in their actions. Thanks for the wonderful hours of exchange, thanks for your questions and for being proactive, especially at the NNOC meeting. Thanks for looking after us, though a moment´s rest didn´t prevail in the tour. Neither in our return !!! Count on Cuba that will never fail you! The blockade must end, Now is the Time!